When a landlord terminates a lease (by entering the unit and changing locks, for example) following the default of a tenant who broke the lease and abandoned the Premises before the end of the term, the tenant is obligated to pay the rent due prior to the termination but has no obligation to pay any rent that accrues after the termination UNLESS the lease otherwise provides. The lease may provide that the tenant will continue to make payments in an amount equal to the rent he had been paying, or in some other amount, when the lease is terminated prematurely. Because an indemnification clause reimburses a landlord for actual losses arising from termination of the lease after the tenant’s default, and because the precise amount of those losses cannot be ascertained until the end of the period specified in the lease, a landlord cannot recover losses under an indemnification clause until the end of the period specified in the lease UNLESS the lease otherwise provides. The parties are free to set forth in a lease when indemnification is due and in what amount. This is all a bit complicated but what it means is that we cannot keep tenants’ Security Deposit after they break the lease unless we make sure our Lease allows us to do that. If the Lease allows us to do that then the question is are we allowed to keep it immediately or must we first return it to the tenant if there are no other damages (per the existing Security Deposit law) and then wait until the end of the term of the Lease before we can try to chase the tenant to get it back (as this new case law seems to suggest) . Hmm? What are your thoughts? My thinking is that we should specify in our Leases a) that we are entitled to the Security Deposit plus advertising costs plus difference in new rent, etc and b) that we can keep it immediately. People ask why I sell my Lease for so much money. Actually, it isn’t much. It’s important to have a good Lease. Leases are documents that should be updated as new case laws are decided. 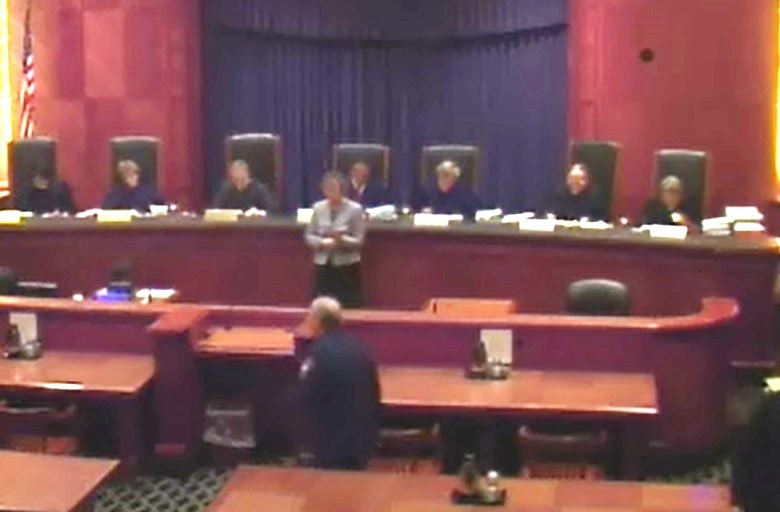 You can also watch the video of the oral arguments here – SJC Oral Arguments on SJC-11217. Suffolk. Jan. 7, 2013. – April 30, 2013. CIVIL ACTION commenced in the Superior Court Department on May 29, 2008. The case was heard by Charles T. Spurlock, J., on motions for summary judgment, and entry of final judgment was ordered by Carol S. Ball, J.
David G. Hanrahan (John G. Hofmann with him) for the plaintiff. Bruce E. Falby (Matthew Iverson with him) for the defendants. Adam N. Lewis & Neil R. Janulewicz, Jr., for Arts & Business Council of Greater Boston, Inc., amicus curiae, submitted a brief. Lawrence P. Heffernan, John T. Ronayne, Danielle Andrews Long, & Kendra L. Berardi, for Real Estate Bar Association for Massachusetts & another, amici curiae, submitted a brief. Background. On April 13, 2006, 275 Washington Street Corp., as trustee of the Washington Street Realty Trust II (landlord), and Hudson River International, LLC (tenant), entered into a twelve-year lease for commercial space at 221-275 Washington Street in downtown Boston (premises). The lease required the tenant to occupy and use the premises as a dental office and to pay the landlord monthly rent plus a share of the operating costs and real estate taxes. Under paragraph 21(h) of the lease, if the tenant defaulted, the landlord had the right to reenter and take possession of the premises, and declare the term of the lease ended, “without prejudice to any remedies which might be otherwise used for arrears of rent or other default.” Paragraph 21(h) also included an indemnification clause, which provided that “Tenant shall indemnify Landlord against all loss of rent and other payments which Landlord may incur by reason of such termination during the remainder of the term.” The lease did not grant the landlord a liquidated damages remedy or any other remedy apart from indemnification for the loss of posttermination rent, but included a cumulative remedies clause in paragraph 44(j) that provided, “No remedy or election hereunder shall be deemed exclusive but shall, whenever possible, be cumulative with all other remedies at law or in equity.” The lease also required a separate guaranty agreement to be executed by Laboratorio Lucas Nicolas S.L. (guarantor), as additional security for the tenant’s obligations under the lease. The tenant took possession of the premises on April 16, 2006, but closed its dental office in May, 2007, and removed its equipment in October, 2007. The tenant continued to make base rent payments through March, 2008, but on May 7, 2008, it notified the landlord that it would be making no further rental payments and that it would not be resuming occupation of the premises. On May 9, 2008, the landlord sent a letter to both the tenant and the guarantor, listing the tenant’s defaults, and declaring that the landlord would “avail itself of all remedies to which it [was] entitled under the Lease, including but not limited to re-entering the premises and taking possession and declaring the term of [the] Lease ended.” The landlord reentered and took possession of the premises on May 19, 2008, thereby terminating the lease. In March, 2010, the landlord signed a new ten-year lease for the premises with a replacement tenant, extending beyond the April 16, 2018, termination date of the original lease, at a lower rent than was agreed on under the original lease. On May 29, 2008, the landlord filed suit in the Superior Court against the tenant and guarantor for breach of contract, seeking to recover all damages arising from the breach. The tenant filed a partial motion to dismiss, arguing that under the indemnification clause of the lease, posttermination damages for lost rent were only recoverable after the term of the lease had ended. The judge denied the motion on July 28, 2009. He recognized that “[i]t may be difficult, if not impossible, to calculate future damages with reasonable certainty if it is unknown whether the subject premises will be leased, for what price, on what conditions, and for what length of time,” but he noted that it may be premature to conclude that future damages are speculative because the landlord before trial may enter into a lease with a replacement tenant covering all or part of the lease term. The landlord moved for partial summary judgment as to liability, and the tenant cross-moved for partial summary judgment, conceding liability for unpaid rent that became due prior to the termination of the lease, but renewing its argument that posttermination damages for lost rent were only recoverable under the indemnification clause after the term of the lease had ended. On April 6, 2010, after the new lease with the replacement tenant had been executed, a different judge allowed the landlord’s motion for summary judgment as to liability and denied the tenant’s motion. The judge concluded that the landlord may immediately recover the rent and costs owed before the termination of the lease and that, because the landlord had rented the premises to a replacement tenant for the remainder of the original lease term, the landlord may also “immediately recover … loss of future rents and costs based on the indemnity provision of the Lease.” He also concluded that the amount of damages could not be resolved on the summary judgment record, and invited the parties to submit supplementary summary judgment memoranda on the extent of damages. Based on these submissions, yet another judge found that the landlord was entitled to pretermination damages in the amount of $37,176.24, lost rent from the termination of the lease to September, 2010–when the new tenant took occupancy of the premises–in the amount of $449,759.92, and attorney’s fees in the amount of $103,367.91, for which both the tenant and the guarantor were jointly liable. The judge identified the remaining disputes that needed to be resolved, either by motion or trial, including the amount of the rent differential between the breached lease and the new lease, “and when that value should be assessed.” To avoid the cost of a trial, the parties stipulated that judgment should enter for the landlord against the defendants in the amount of $1,092,653.36, which included prejudgment interest of $38,075.36, [FN5] but the defendants expressly reserved their right to appeal all issues they raised in the motion for partial summary judgment. Id. at 429 (Kantrowitz, J., concurring). We granted the landlord’s application for further appellate review. See Restatement (Second) of Property, Landlord and Tenant § 12.1 comment g, at 389 (1977) (“The obligation of the tenant to pay rent does not arise for any period after the lease is terminated. The parties to the lease may provide that the tenant will continue to make payments in an amount equal to the rent he had been paying, or in some other amount, when the lease is terminated prematurely. Under such an agreement, the landlord may collect these payments, but the payments due will not be rent …”). As a result of this well-established rule, “virtually all commercial leases in Massachusetts (and in other jurisdictions) contain provisions which specify the landlord’s remedies explicitly and frequently in considerable detail” where the tenant has breached and the landlord has terminated the lease. See R.M. Carney & J.T. Ronayne, Lease Drafting in Massachusetts § 6.5.2, at 6-106 (Mass. Cont. Legal Educ.3d ed.2010). A typical clause in a lease provides a landlord with some form of liquidated damages or indemnification, or both. [FN6] Id. at 6-106 to 6-107. A liquidated damages provision contractually obligates a tenant to make a specified payment or series of payments to the landlord in the event of a breach. See id. at 6-107; 24 R.A. Lord, Williston on Contracts § 65.1, at 229 (4th ed.2002) (“liquidated damages clause is designed to substitute a sum agreed upon by the parties for any actual damages suffered as a result of a breach”); Restatement (Second) of Contracts § 356 comment a, at 157 (1981) (“parties to a contract may effectively provide in advance the damages that are to be payable in the event of breach”). See also Cummings Props., LLC v. National Communications Corp., 449 Mass. 490, 491, 494 (2007) (“rent acceleration clause, in which a defaulting lessee is required to pay the lessor the entire amount of the remaining rent due under the lease, may constitute an enforceable liquidated damages provision so long as it is not a penalty”). An indemnification clause does “not provide for liquidation of damages …, nor indeed for any right to damages for breach of the covenant to pay rent,” Manhattan Props., Inc. v. Irving Trust Co., 291 U.S. 320, 337 (1934), but instead requires a defaulting tenant to reimburse the landlord for actual losses resulting from termination of the lease. See Gardiner v. Parsons, 224 Mass. 347, 350 (1916) (indemnification “is a liability contingent upon events thereafter occurring, because the full amount which the lessee eventually must pay for the remainder of the term cannot be wholly ascertained until the period ends”). 1. The contractual remedy of indemnification. Because an indemnification clause reimburses a landlord for actual losses arising from termination of the lease after the tenant’s default, and because the precise amount of those losses cannot be ascertained until the end of the period specified in the lease, a landlord cannot recover losses under an indemnification clause until the end of the period specified in the lease. See Zevitas v. Adams, 276 Mass. 307, 317 (1931) (“Recovery under an indemnity clause of a lease cannot be had until the specified term of the lease has ended”); Merchants Nat’l Bank v. Ryerson, 251 Mass. 314, 319 (1925); Gardiner v. Parsons, supra. See also Manhattan Props., Inc. v. Irving Trust Co., supra at 338 (fulfilment of contract indemnity contingent on what may happen “up to the end of the original term”). The judge who decided the cross motions for partial summary judgment recognized our general rule that recovery of losses under an indemnification clause must wait until the end of the lease period, but, relying on Woodbury v. Sparrell Print, 187 Mass. 426, 431 (1905) (Woodbury ), concluded that an exception to this rule exists where, as here, the landlord finds a replacement tenant for the remainder of the original lease period. As the Appeals Court noted, this judge’s reliance on Woodbury is misplaced. See 275 Washington St. Corp., supra at 423-425. In Woodbury, supra at 428, a clause in the lease provided that, where the landlord terminates the lease after a breach by the tenant, “the [tenant] shall be liable to the [landlord] for all loss and damage sustained by the [landlord] on account of the premises remaining unleased, or being let for the remainder of the term for a less rent than that herein reserved.” We interpreted this clause to create two separate indemnification provisions: the first covering the period when the premises remained unleased, and the second covering the period when the premises were let for the remainder of the term at a lower rent than the rent provided in the lease. Id. at 431. We read the first indemnification provision to require a single payment for losses incurred before the premises were relet, to be paid once the premises were relet. Id. Because the premises were not relet, we concluded that the time for payment under that provision had yet to arrive. Id. We did not reach the second indemnification provision because the triggering event of a new lease had yet to occur. We recognize that, because this court in Woodbury declared that losses under the first indemnification provision would become due once the premises were relet, losses under the second indemnification provision for rent differential might also become due at that time, even though the possibility remained that the replacement tenant would default on the new lease, causing the premises to again become unleased. But, if losses under both indemnification provisions were due once the property was relet, it was only because the parties in the Woodbury case had included specific language in the indemnification provisions of their lease that provided that losses were due to be indemnified upon the reletting of the premises, and not because indemnification damages are due under the common law once the premises are relet. See 275 Washington St. Corp., supra at 424 (“where the indemnification period provided for in the lease, during which any damages may accrue, has not yet ended, damages cannot be properly assessed”). The parties are free to set forth in a lease when indemnification is due and in what amount, but where, as here, the lease does not specify when indemnification is due, indemnification under our common law does not become due until the end of the original lease term, when damages may be “wholly ascertained.” Gardiner v. Parsons, supra at 350. See Zevitas v. Adams, supra at 317. Having concluded that we do not currently recognize an exception to this common-law rule where premises are relet for the remainder of the lease term, we turn now to whether we should create such an exception. We respect the importance of continuity and predictability in the common law, but where we have concluded that the common law is broken, we have been willing to fix it. See, e.g., Papadopoulos v. Target Corp., 457 Mass. 368, 369 (2010) (changing common law regarding tort liability arising from natural accumulation of snow or ice); Soule v. Massachusetts Elec. Co., 378 Mass. 177, 181-182 (1979) (changing common law by establishing “duty of reasonable care by a landowner or occupier to prevent harm to foreseeable child trespassers”). We recognize the possibility, as did the Appeals Court, that our common-law rule, which requires the landlord to wait until 2018 to determine posttermination damages under the indemnification clause, “may in effect make it impossible for the landlord to recover its true damages from this corporate tenant or guarantor, because of the protections afforded by legal processes, such as dissolution or bankruptcy.” 275 Washington St. Corp., supra at 425. [FN7] We also recognize that, once a landlord executes a new lease of the premises for the remainder of the original lease term, the differential in base rent may be calculated with a reasonable degree of certainty. See id. at 429 (Kantrowitz, J., concurring). We nonetheless conclude for two reasons that our common-law rule governing indemnification for posttermination losses is not broken and need not be fixed. First, although reletting the premises for the duration of the original lease period diminishes the uncertainty as to the amount of the posttermination loss, a substantial degree of uncertainty remains. The rent in many commercial leases is not limited to base rent, but also includes variables such as percentage rent, where the landlord receives a percentage of the gross or net revenues of the leased premises. See F.T. Talty, P.S. Talty, & A.L. Braunstein, Methods of Practice § 17:113 (4th ed.2000); R.M. Carney & J.T. Ronayne, Lease Drafting in Massachusetts § 6.2.1, at 6-9 (Mass. Cont. Legal Educ.3d ed. 2010) (“Today the fixed minimum rent plus percentage rent lease is the standard for shopping center and other retail leases …”). Therefore, even if the new tenant were timely to pay the rent due for the balance of the original lease period, it may not be simple to calculate the rent differential between the original lease and the new lease at the time the premises are relet. Apart from the uncertainties regarding a new tenant’s commercial success in the premises, various additional uncertainties arise from the perils of commercial existence that may affect the actual amount of posttermination loss. For instance, the premises may be destroyed by fire, a contingency that generally ends a tenant’s liability under the lease. See Bowditch v. Raymond, 146 Mass. 109, 115 (1888). Or the replacement tenant may default and vacate the premises before the end of the original lease period, and the landlord may again terminate the lease and enter into a third lease, possibly at a rental rate above that set in the original lease. Or the landlord may sell the premises, and eliminate the indemnified amount due from the tenant after the date of sale. See Krasne v. Tedeschi & Grasso, 436 Mass. 103, 109 (2002) (“When the landlord sold the property, it was compensated for the rental value of the property through the end of the defendants’ lease term and beyond”). In short, to the extent that the common-law rule rests on the need accurately to calculate the amount of the loss to be indemnified, the reletting of the premises may not permit the calculation of those losses to a reasonable degree of certainty. Second, and more important, the common-law rule applies only where the parties to a lease have provided a remedy of indemnification without specifying a time period when the amount is due. To be enforceable under the Commonwealth’s statute of frauds, every lease must be memorialized in writing. See G.L. c. 259, § 1. Commercial leases are commonly drafted by the landlord, or its attorney, and may specify the remedy provided for a landlord’s posttermination loss. Where the specified remedy is indemnification, and no other time period is established as to when payment is due, a landlord has fair notice under our common law that the indemnified amount shall become due at the end of the original lease period. If the landlord wants the indemnified amount to become due once the property is relet, it may insist that the lease so provide, and identify the means to calculate the amount of indemnified loss. Where the consequence of contractual silence has been clear under our common law, and where landlords need not enter into any lease that fails to provide them with the remedies they desire for posttermination loss, we see no justification to change our common law to give landlords an earlier due date for indemnification than that which they negotiated. 2. Cumulative remedies clause. The landlord contends that, even if it must wait until the end of the contract term to obtain reimbursement of posttermination losses under the indemnification clause, it is entitled now under the “cumulative remedies” clause in paragraph 44(j) of the lease to posttermination damages under the common law of contract. [FN8] Paragraph 44(j), however, does not create a remedy under the contract; it merely declares that a party’s election of one remedy does not foreclose the party’s ability to seek another remedy that is available “at law or in equity,” and thereby preserves the parties’ ability to pursue alternative available remedies. As applied here, the cumulative remedies clause simply means that if the landlord has an alternative remedy for posttermination damages apart from indemnification under the lease, it is not foreclosed from pursuing that remedy because of its ability to seek indemnification. Cf. Rae F. Gill, P.C. v. DiGiovanni, 34 Mass.App.Ct. 498, 501-503 (1993) (contract clause providing for remedies of arbitration and “all other remedies available … in law or equity” allowed party seeking enforcement to elect between arbitration or litigation). The landlord claims that it has an alternative remedy for posttermination damages: a claim for “benefit of the bargain” contract damages under the common law of contract. Its argument is straightforward: A commercial lease is a contract, the tenant breached the contract, and the common law provides a remedy for breach of contract even where the contract is silent as to remedies. See Boston Hous. Auth. v. Hemingway, 363 Mass. 184, 198 (1973) (“modern view favors a new approach which recognizes that a lease is essentially a contract between the landlord and the tenant”). We also agree that a tenant’s failure timely to pay rent as required by the terms of the lease is a breach of contract, and that, generally, where a party breaches a contract, the aggrieved party is entitled to damages under the common law of contract that will give the aggrieved party the “benefit of the bargain,” that is, place the aggrieved party in roughly the same position in which it would have been had the breaching party complied with the contract. See John Hetherington & Sons v. William Firth Co., 210 Mass. 8, 21 (1911) (“fundamental principle of law upon which damages for breach of contract are assessed is that the injured party shall be placed in the same position he would have been in, if the contract had been performed”); Fecteau Benefits Group, Inc. v. Knox, 72 Mass.App.Ct. 204, 208-209 (2008), quoting Doering Equip. Co. v. John Deere Co., 61 Mass.App.Ct. 850, 855-856 (2004) (“long-settled rule for breach of contract recovery is that a wronged party is entitled to receive the benefit of the bargain, that is, ‘be placed in the same position as if the contract had been fully performed’ “). However, as discussed supra at, where the contract is a commercial lease, our common law does not provide “benefit of the bargain” damages in the event of termination of the lease following a breach. Once a landlord terminates a lease, the tenant is no longer obligated to pay the rent, and, unless the lease otherwise so provides, the landlord is not entitled to posttermination damages. To grant a landlord “benefit of the bargain” damages under our common law would be fundamentally in conflict with this principle because the damages that would make the landlord whole would primarily be the rent forgone from the date of the breach through the end of the lease period, including the period following the landlord’s termination of the lease. Therefore, unless we change our common law, the landlord here has no alternative remedy for posttermination losses that would be protected by the cumulative remedies clause; the landlord’s sole remedy is indemnification. We see no justification to change our common law to provide a landlord with a “benefit of the bargain” damages remedy after termination of the lease. For more than one hundred years, our common law has given landlords fair notice that they have no remedy for posttermination damages unless the commercial lease specifies a contractual remedy, and commercial landlords in Massachusetts have typically adapted to this rule by specifying the landlord’s remedies in the lease. See R.M. Carney & J.T. Ronayne, Lease Drafting in Massachusetts § 6.2.1, at 6-9 (Mass. Cont. Legal Educ.3d ed.2010). The inclusion of clauses providing liquidated damages or indemnification to remedy a landlord’s posttermination losses is a proper subject of negotiation between the parties to the lease, and landlords and tenants may bargain over the content of such provisions. A landlord left without an adequate remedy following breach of the lease by a tenant has only itself to blame for entering into a lease that fails to provide such a remedy. We shall not disrupt the settled expectations of leasing parties in order to protect a landlord from the consequences of failing to insist on an adequate remedy in the negotiation of a commercial lease. Nor shall we invite uncertainty as to the availability and scope of a landlord’s remedy for “benefit of the bargain” damages where the contours of such a remedy are not delineated in the lease but left to be determined under the common law. [FN9] In short, as with our common-law rule that indemnification is not due until the end of the lease term unless the lease otherwise specifies, we do not find this common-law rule to be broken and therefore see no reason to fix it. Conclusion. We affirm that part of the judgment finding the tenant liable for breach of the lease, and assessing damages for the period before termination of the lease in the amount of $37,176.24, plus prejudgment interest calculated at the lease rate of 6.25 per cent. We vacate that part of the judgment assessing damages for the period following termination of the lease, and awarding attorney’s fees, [FN12] and we remand the matter to the Superior Court for further proceedings consistent with this opinion. FN1. Of the Washington Street Realty Trust II. FN2. Doing business as Vital Dent. FN3. Laboratorio Lucas Nicolas S.L. FN4. We acknowledge the amicus briefs of the Real Estate Bar Association for Massachusetts and the Abstract Club, and of the Arts & Business Council of Greater Boston, Inc.
FN5. The stipulation identified the categories of damages for which prejudgment interest would be earned, the methodology used in calculating the amount of interest, and the interest rate to be applied. FN6. Where a lease provides for both liquidated damages and indemnification, a landlord, on termination, may not collect on both remedies. See Cotting v. Hooper, Lewis & Co., 220 Mass. 273, 276 (1915). See also Gardiner v.
Parsons, 224 Mass. 347, 350 (1916). FN7. Like the Appeals Court, we do not address whether a landlord would be entitled to prejudgment security where necessary to secure its anticipated future claim for indemnification damages. See 275 Washington St. Corp. v. Hudson River Int’l, LLC, 81 Mass.App.Ct. 418, 428 n. 12 (2012) (“Our decision is not intended to suggest … that the landlord has no basis to seek prejudgment security”). FN8. Paragraph 44(j) of the lease provides: “No remedy or election hereunder shall be deemed exclusive but shall, whenever possible, be cumulative with all other remedies at law or in equity”. to make further monetary payments to the landlord. The landlord may still seek to recover unpaid rents that accrued prior to the time of lease termination. In addition, the landlord may also be able to recover money from the tenant based on the existence of a lease provision specifying that the tenant’s obligation to pay rent will continue after premature termination of the lease”). See, e.g., Gigax v. Boone Village Ltd. Partnership, 656 N.E.2d 854, 858 (Ind.Ct.App.1995) (after landlord terminates lease “all liability under it for future rent [is] extinguished” absent express lease clause to contrary); Benderson v. Poss, 142 A.D.2d 937, 938 (N.Y.App.Div.1988) (landlord generally not entitled to collect rent payments after termination of lease, but “landlord and tenant may contract for the tenant’s continued liability after the termination of the landlord-tenant relationship … what survives after the termination of a lease is not a liability for rents, but a liability for damages,” under contractual provision fixing damages). But see, e.g., Schneiker v. Gordon, 732 P.2d 603, 611 (Colo.1987) (“landlord should be permitted to maintain an action for contract damages caused by a tenant’s wrongful abandonment so that the landlord is able to receive the benefit of his bargain”). lease “guarantors … were liable only to the extent that [the tenant] could be found liable”). FN12. Under paragraph 29 of the lease, “the losing party shall pay the prevailing party a reasonable sum for [attorney’s] fees and costs in such suit, at trial and on appeal, and such [attorney’s] fees and costs shall be deemed to have accrued on the commencement of such action.” The landlord was the prevailing party at the time of judgment, but the tenant has prevailed as to the issues on appeal. On remand, the judge shall determine whether to assess attorney’s fees in accordance with this clause in the lease, and the amount to be assessed. FINALLY, FINALLY, FINALLY! WE CAN SEARCH EVICTIONS ONLINE IN MA!